CPO 3rd month Apr futures contract traded RM12 higher to close at RM2510 levels as compare to previous trading sessions with a total of 10,318 lots traded in the market. CPO price traded higher despite opened lower upon open for trading despite crude oil and soybean oil electronic trading were traded mix during electronic trading while plunge lower during overnight trading. CPO price traded higher during trading session after manage to complete wave 4 count at RM2472 regions; 38.1% Fibonacci support levels but buying activity put on halt at RM2520 regions, 38.1% Fibonacci resistance levels range from RM2726 and RM2393. Technically, FCPO price temporary on halt as attempt to penetrate resistance levels at RM2520 failed during trading sessions. However, there still yet signal to affirm CPO price would reverse trading lower in the coming trading session as support levels at RM2494 and RM2475 has yet violated during the trading sessions. Resistance levels were seen at RM2535 and RM2565 regions. FKLI Feb Futures contract traded 7.5 points lower to close at 1260.5 levels as compare to previous trading session to with a total of 2,393 lots traded in the market. FKLI traded sideways towards lower during trading sessions as Dow Jones overnight traded weak while regional equity indices and Dow Jones futures electronic traded plunge lower before end of trading sessions. 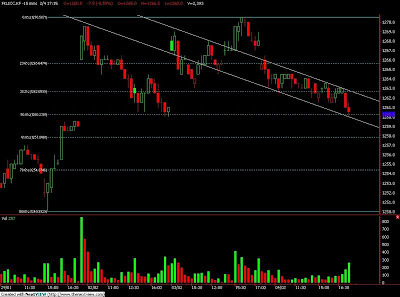 FKLI traded within downtrend channel throughout entire trading sessions with significantly lower daily traded volume. Technically, FKLI attempt to challenge support levels at 1260; 50% Fibonacci support levels, while next nearest support levels seen at 1248 regions. However, FKLI still view would rebound higher in the coming trading sessions despite medium term trading trend still looking towards bearish site. Resistance levels seen at 1265 and 1272 regions in the case provided FKLI would trade higher in the coming trading sessions. Feb. 4 (Bloomberg) -- Crude oil traded near $77 a barrel in New York after dropping on a U.S. Energy Department report that showed a bigger-than-forecast increase in inventories as refineries idled units and imports climbed. Oil declined 0.3 percent yesterday after the report said refineries operated at 77.7 percent of capacity, the lowest rate since at least 1989, excluding two periods of hurricane strikes along the Gulf of Mexico. Crude supplies rose 2.32 million barrels to 329 million last week. A 400,000 barrel gain was forecast in a Bloomberg News analyst survey. Crude oil for March delivery traded at $76.94 a barrel, down 4 cents, in electronic trading on the New York Mercantile Exchange at 11:35 a.m. Sydney time. Yesterday, the contract fell 25 cents to settle at $76.98. Oil prices jumped as much as 81 cents and slipped 71 cents during yesterday’s session. Prices also declined as the dollar gained against the euro for the first time in three days after a report showed U.S. companies cut fewer jobs. A stronger U.S. currency reduces the appeal of commodities as an alternative investment. The greenback traded at $1.3897 per euro at 11:12 a.m. Sydney time, from $1.3893 yesterday. Refinery operating rates plunged to 66.7 percent of capacity in September 2008 when ports were shut because of hurricanes Gustav and Ike. The previous low of 69.8 percent was reached in September 2005 after hurricanes Katrina and Rita. Imports of crude oil rose 7.1 percent to 8.43 million barrels a day last week, the biggest increase since September, the report showed. Fuel imports climbed 2.6 percent to 2.95 million barrels, the highest level since November. Stockpiles of gasoline and distillate fuel, a category that includes heating oil and diesel, fell. Distillate supplies dropped 948,000 barrels to 156.5 million. Inventories were estimated to drop 1.15 million barrels. Brent crude oil for March settlement dropped 14 cents to $75.92 a barrel at the end of the session on the London-based ICE Futures Europe exchange yesterday. Feb. 4 (Bloomberg) -- The yen strengthened after an Australian report showed retail sales unexpectedly declined, boosting demand for the relative safety of Japan’s currency. The yen advanced to 126.20 per euro as of 9:37 a.m. in Tokyo from 126.42 yesterday in New York. It climbed to 90.88 versus the dollar from 90.98. FCPO April Futures contract surge RM46 higher as compare to previous trading sessions to close at RM2498 with a total of 13,357 lots traded in the market. FCPO price were opened and traded higher during trading sessions as soybean oil and crude oil overnight trading and electronic trading were traded firm during trading hours. FCPO price manage to penetrate and hold above previous high levels at RM2364 and RM2475 regions during trading sessions while manage to meet 138.1% Fibonacci resistance levels at RM2501 regions before sessions was closed for trading. Technically, FCPO price seems bullish on short term time frame after manage to break up above consolidation range from RM2400 to RM2490 regions provided support levels at RM2464 and RM2427 were not violated during trading session. However, FCPO price might encounter some degree of selling pressure around resistance levels at RM2520 and RM2535 regions. FKLI January Futures contract was traded 7 points higher as compare to previous trading session to settle at 1268 levels with a total of 4,184 lots traded in the market. FKLI traded higher after manage to search for support level during intraday trading sessions despite regional indices and Dow Jones futures electronic trading were traded higher during trading sessions. FKLI regain strength to surge higher after found support around 1263.5 regions, 61.8% Fibonacci support levels in the 15min price chart before manage to penetrate higher region at 1270.5 levels in the latter trading sessions. 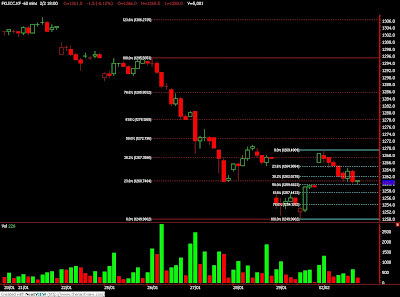 Technically, FKLI encounter multiple retrace due to great selling activities around resistance levels at 1272, 50% Fibonacci resistance levels while next nearest resistance levels seen at 1279 and 1285.5, both were 61.8% and 78.6% Fibonacci resistance levels. FKLI would remain undergoing correction phase provided critical resistance levels at 1295.5 was not violated during trading sessions. However, selling pressure was seen undertaken provided support levels at 1259.5 and 1250 regions were not violated during trading sessions. Feb. 3 (Bloomberg) -- Oil pared gains and traded below $77 a barrel in New York after an industry report showed a larger- than-expected increase in crude stockpiles in the U.S., the world’s biggest energy consumer. Oil declined for the first day in three after the American Petroleum Institute reported crude inventories rose 4.72 million barrels last week. An Energy Department report today may show stockpiles increased 400,000 barrels, according to a Bloomberg News survey of analysts. The API crude inventory figure “is a bit more than expected and that could be the reason for a little bit of weakness,” said Ben Westmore, a minerals and energy economist at National Australia Bank Ltd. in Melbourne. “The strength over the past few days partially has been the low levels it has been coming off,” he said. Crude oil for March delivery dropped as much as 43 cents, or 0.6 percent, to $76.80 a barrel in electronic trading on the New York Mercantile Exchange. It was at $76.81 at 10:16 a.m. Singapore time. Yesterday, the contract climbed $2.80 to $77.23, the biggest gain since Sept. 30. The Energy Department report today will probably show that supplies of distillate fuel, a category that includes heating oil and diesel, dropped 1.15 million barrels last week, according to the survey. Gasoline stocks probably climbed 1.4 million barrels last week. The Energy Department is scheduled to release its weekly report at 10:30 a.m. today in Washington. Oil advanced yesterday as a report showed sales of previously owned homes strengthened in December and the dollar weakened, spurring investors to buy raw materials as an alternative investment. Prices also climbed as U.S. equities rose after profit at companies from Lexmark International Inc. to D.R. Horton Inc. topped estimates. The contract climbed 2.1 percent on Feb. 1 after a report showed manufacturing in the U.S. increased at the fastest pace since 2004. The Institute for Supply Management’s factory index climbed to 58.4 in January from December’s 54.9. Readings of more than 50 signal an expansion. Manufacturing accounts for about 12 percent of the economy. U.S. gasoline futures climbed 4.4 percent yesterday after a report showed demand rose to the highest since Dec. 18. Motorists bought an average 9.42 million barrels a day in the week ended Jan. 29, according to MasterCard Inc.’s SpendingPulse report. Consumption rose 0.5 percent from the prior week. Brent crude oil for March settlement was at $75.68 a barrel, down 38 cents, on the London-based ICE Futures Europe exchange at 10:15 a.m. Singapore time. The contract rose $2.95, or 4 percent, to $76.06 a barrel yesterday. CPO 3rd month Apr futures contract traded RM7 higher to close at RM2452 levels as compare to previous trading sessions with a total of 7,645 lots traded in the market. CPO price was traded higher after found greater buying interest during trading sessions as some profit taking activity occur during soybean oil electronic trading despite crude oil and soybean oil were traded higher during overnight trading. CPO price traded higher found support around RM2430 regions, 61.8% Fibonacci support levels, after attempt to penetrate resistance levels at RM2474 failed. Technically, CPO price seems attempted to penetrate 1st resistance trend line around RM2456 regions, 78.6% Fibonacci resistance levels while 2nd resistance level based on parabolic arc seen at RM2490 regions. However, CPO price view as bullish provided support levels at RM2430 and RM2410 were not violated during trading sessions. Resistance levels were seen at RM2490 and RM2530 regions in order to trigger further buying interest towards the high side. FKLI Feb Futures contract traded 1.5 points lower to close at 1261 levels as compare to previous trading session to with a total of 5,001 lots traded in the market. FKLI traded lower after open higher in the morning sessions despite Dow Jones closed higher during overnight trading while regional indices were traded mix based on Asia major equity indices. FKLI open higher at 1267.5 but lose strength during trading sessions and traded lower towards support levels at 1260 regions; 50% Fibonacci support levels upon close for trading. Technically, FKLI seems partially forming inverted head and shoulder formation in hourly price chart where neckline seen at 1270 regions provided support levels at 1257.5 and 1249.5 regions. 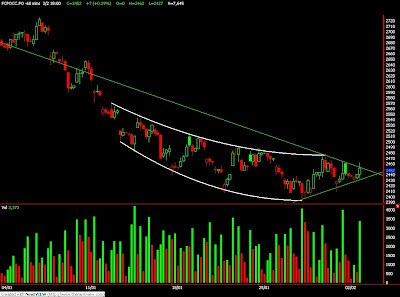 However, FKLI still yet to confirm a bullish market as rebound was more appropriate in the correction phase. 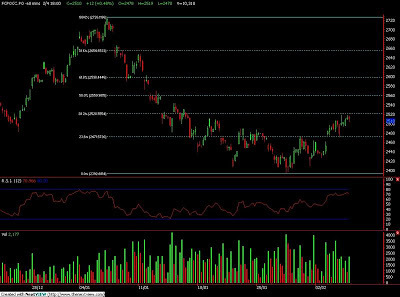 Resistance levels were seen at 1272 and 1285 regions. Feb. 2 (Bloomberg) -- Crude oil rose for a second day in New York after manufacturing in the U.S. increased at the fastest pace since August 2004, signaling that fuel use in the world’s biggest energy-consuming country may gain. Oil advanced the most in four weeks yesterday after the Institute for Supply Management’s factory index climbed to a higher-than-anticipated 58.4 in January, from December’s 54.9. European manufacturing also increased as companies raised output to meet reviving global demand, a separate report showed. Energy Department data tomorrow may show a drop in U.S. distillate fuel inventories. Crude oil for March delivery gained as much as $1.01, or 1.4 percent, to $75.44 a barrel in electronic trading on the New York Mercantile Exchange. It was at $75.17 at 10:03 a.m. Singapore time. Yesterday, the contract rose 2.1 percent to settle at $74.43, the biggest one-day increase since Jan. 4. The U.S. manufacturing figure exceeded the median forecast of 55.5 from 67 economists surveyed by Bloomberg News. Readings higher than 50 signal an expansion. Manufacturing accounts for about 12 percent of the economy. European companies raised production in January as a global economic recovery spurred exports. An index of manufacturing in the 16-nation euro region climbed to 52.4 from 51.6 in December, London-based Markit Economics said yesterday. U.S. distillate fuel stockpiles, including heating oil and diesel, probably fell last week as wholesalers prepared for colder weather, a Bloomberg News survey showed. Inventories declined 1.15 million barrels in the week ended Jan. 29, based on the median of 12 estimates from analysts before tomorrow’s the Energy Department report. Supplies previously climbed to 157.5 million barrels, 16.2 percent above the five-year average level. Colder weather moved into the U.S. Northeast, which consumes about four-fifths of the country’s heating oil, over the final days of last month. Temperatures across the eastern states will be below normal from Feb. 9 to Feb. 15, according to the National Weather Service. Brent crude oil for March settlement rose as much as $1.41, or 1.9 percent, to $74.52 a barrel on the London-based ICE Futures Europe exchange. It was at $73.87 at 10 a.m. Singapore time. Yesterday, the contract climbed 2.3 percent, the most since Jan. 4, to settle at $73.11. Feb. 2 (Bloomberg) -- Gold may extend its biggest rally in three months as the dollar’s advance stalled, bolstering demand for the metal as an alternative investment. Gold for immediate delivery was little changed at $1,104.38 an ounce at 9:09 a.m. in Singapore. The metal rallied 2.3 percent yesterday, the most since Nov. 3. The greenback fell from a six-month high against a basket of six currencies yesterday, shedding as much as 0.4 percent. Bullion, which typically moves inversely to the dollar, declined for a second month in January as the dollar rallied 2 percent against a basket of six major currencies. The metal reached $1,226.56 on Dec. 3, the highest price ever. President Barack Obama yesterday sent Congress a $3.8 trillion budget that puts an emphasis on job creation, including $100 billion in additional stimulus spending. The deficit in the year starting Oct. 1 is projected at $1.3 trillion. Silver decreased 0.1 percent to $16.655 an ounce, platinum fell 0.1 percent to $1,549.25 an ounce and palladium was up 0.2 percent at $432.75 an ounce. Feb. 2 (Bloomberg) -- The yen weakened against most of its major counterparts as optimism the global economic recovery is gaining momentum spurred demand for stocks and other higher- yielding assets. The Japanese currency retreated from a nine-month high against the euro before reports forecast to show rising retail sales in Germany, Europe’s largest economy, and improving U.S. home sales. Australia’s currency advanced against the yen on expectations the nation’s central bank will today raise its benchmark interest rate to 4 percent. The yen traded at 126.30 per euro as of 11:09 a.m. in Tokyo from 126.24 in New York yesterday when it hit 124.43 yen, the strongest level since April 28. The euro traded at $1.3907 from $1.3931 in New York when it fell to $1.3853, the weakest level since July 8. The dollar fetched 90.79 yen from 90.61 yen. Australia’s currency traded at 89.08 U.S. cents from 89.14 cents, and at 80.88 yen from 80.76 yen. All 20 economists in a Bloomberg News survey forecast the Reserve Bank of Australia will raise its benchmark rate by 0.25 percentage point today. Swaps traders are betting on a 71 percent chance of such a decision, according to a Credit Suisse Group AG index. Benchmark interest rates are 3.75 percent in Australia and 2.5 percent in New Zealand, compared with 0.1 percent in Japan and as low as zero in the U.S., attracting investors to the South Pacific nations’ higher-yielding assets. The risk in such trades is that currency market moves will erase profits. German retail sales, adjusted for inflation and seasonal swings, rose 0.9 percent in December from the previous month, according to a Bloomberg News survey of economists before the Federal Statistics Office in Wiesbaden releases the data today. The number of contracts to buy previously owned U.S. homes rebounded 1 percent in December after plummeting 16 percent the previous month, a separate survey showed ahead of the National Association of Realtors’ report today. The yen fell for a third day against the dollar after the Institute for Supply Management said U.S. manufacturing expanded at the fastest pace in five years, sparking a global equity rally. ISM’s factory gauge rose to 58.4 in January, compared with the median economist estimate of 55.5. The Standard & Poor’s 500 Index rose 1.4 percent yesterday and the MSCI World Index snapped an eight-day losing streak, advancing 0.9 percent. The Nikkei 225 Stock Average rose 1.8 percent today while the MSCI Asia Pacific Index of regional shares gained 1.5 percent. The yen also weakened against higher-yielding currencies amid speculation U.S. lawmakers will dilute proposed curbs on the size and risk-taking by banks. Richard Shelby, the ranking Republican on the Senate Banking Committee, said yesterday through a spokesman that a proposal by the Obama administration to restrict proprietary trading by banks should be examined by lawmakers. The president’s proposal may be either significantly modified or dropped, DealReporter said, citing unidentified lawmakers and staffers. DealReporter is part of the Financial Times Group. “A drastic modification of this plan, if achieved, may halt the unwinding of positions in higher-yielding assets and revive some flow back into them,” said Takashi Kudo, general manager of market information service in Tokyo at NTT SmartTrade Inc., a unit of Nippon Telegraph & Telephone Corp. The euro remained near the lowest level in almost seven months against the dollar amid concern Greece will struggle to reduce its public deficit. The European Union will issue a review of Greece’s budget- cutting plans tomorrow. The nation’s deficit program is “very ambitious and this will need to be implemented under difficult circumstances,” EU Economic and Monetary Affairs Commissioner Joaquin Almunia said in an interview yesterday in Brussels. The premium investors demand to hold Greek 10-year bonds instead of benchmark German bunds widened to almost 400 basis points last week, the highest since the year before the euro’s debut in 1999. FCPO April Futures contract traded RM6 lower as compare to previous trading sessions to close at RM2445 with a total of 9,981 lots traded in the market. FCPO price were remain traded within sideways range from RM2400 to RM2490 regions as soybean oil and crude oil electronic trading were traded with uncertain direction during trading sessions. FCPO price seems holding above support levels at RM2410, 78.6% Fibonacci support levels, after attempt to penetrate resistance levels RM2490 regions at RM2474. Technically, MACD hourly CPO price chart shows buying strength after 2nd Bull Divergence signal for further confirmation at RM2393 regions while 61.8% Fibonacci support levels seen at RM2410 and RM2358 regions. However, based on the rounding bottom formation in the hourly chart, CPO price need to penetrate resistance levels RM2490 and RM2530 regions in order to trigger further buying activities upon break up signal. FKLI January Futures contract was traded 8 points lower as compare to previous trading session to settle at 1259 levels with a total of 4,178 lots traded in the market. FKLI was traded higher after searched new low at 1250 regions as Dow Jones futures electronic trading was traded higher after regional indices plunge lower on closing in the 2nd trading sessions. FKLI plunge lower after manage to penetrate previous support levels at 1260 regions; 200% Fibonacci support levels in the hourly price chart. Technically, FKLI seems reached support levels at 1250 regions, 250% and 61.8% Fibonacci support levels at 1249.5 regions, while hourly MACD appear to have Bull Divergence with further support levels seen at 1248 and 1227 regions. However, FKLI possible undergo some rebound activities where resistance levels seen at 1272 and 1285 regions. Critical resistance levels were seen at 1295 regions.